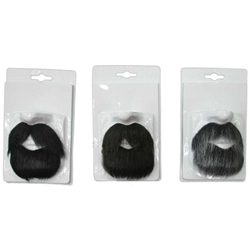 The Amigo Beard and Moustache set includes beard and moustache. Available in Black, Brown, or Gray. Beard and moustache are self-adhesive. Need the perfect addition to your outfit for Cinco De Mayo, Dia De Los Muertos, or Taco Tuesday? Then the Amigo Beard and Moustache set is for you! Great for many other characters and costumes as well. Don't forget your sombrero!